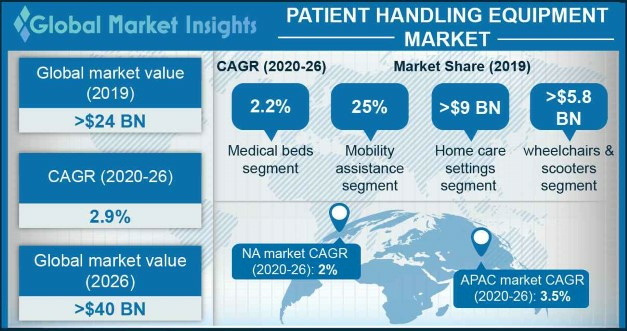 Patient Handling Equipment Market size is set to exceed USD 23 billion by 2024; according to a new research report by Global Market Insights. Rising patient pool suffering from disabilities should impel patient handling equipment growth in forthcoming period. According to Disabled World data, approximately 650 million of global population suffers from some kind of disability, especially females. Number of people with disabilities is accelerating due to some form of chronic illness or age. ‘Americans with Disabilities Act’ states that use of safe patient handling and mobility (SPHM) equipment must be deployed for improving accessibility for disabled patients. Above factors should drive patient handling equipment size in recent years. High risk of suffering from injuries and musculoskeletal disorders (MSDs) by the caregivers should impel patient handling business growth in foreseeable future. According to U.S. department of labor, in 2010, nurses and caregivers had highest rates of MSDs. This largely impacts efficiency and work hours due to effects of patient handling. Above factors will augment adoption of patient handling equipment in recent years. Mechanical and transfer equipment segment will foresee lucrative growth at 12.6% CAGR from 2018 to 2024. High segmental growth is attributable to increasing number of cases associated with disabilities. In addition, these equipment are powered by battery/electricity for patient lifting and rehabilitation along with numerous advantages. Benefits offered by mechanical and transfer equipment will impel customer preference, thereby boosting segmental size. Mobility assistance segment dominated patient handling equipment with 28.3% market share in 2017. Increasing patient pool requiring mobility assistance and support should lead to rise demand for patient handling equipment such as wheelchairs and walkers. Similarly, excessive body weight hampers mobility of the patient. With accelerating number of bariatric population, mobility assistance segment will witness substantial demand in projected timeframe. Hospitals segment will grow at a robust pace of 11.3% during the forecast timeframe owing to availability of technologically advanced patient handling equipment such as ICU beds, sling lifts and slide boards. Effective and cost saving safe patient handling programs increases awareness that will assist segmental growth. Implementation of various guidelines and safety laws will stimulate patient handling equipment market growth across hospitals in the forthcoming period. U.S. patient handling equipment is forecasted to show lucrative growth and accounted for 88.2% of regional size in 2017. Escalating geriatric population, bariatric population and patient pool with chronic ailments should offer momentous market growth. High adoption rate of technologically advanced equipment should further assist U.S. patient handling industry growth in forthcoming period. UK patient handling equipment was valued at USD 668.5 million in 2017 and will witness considerable growth in recent years. Presence of policies and guidelines to support healthcare workforce for safe patient handling will offer attractive market growth opportunity. No lift policy was adopted in UK in response to large number of severity of MSDs and back-pains. Additionally, growing baby boomers and chronic illnesses across the country should augment UK patient handling equipment growth in upcoming years.